Erdogan’s War on the Kurds has opened up yet another Pandora’s Box in the Mideast, with it looking ever more likely that the current conflict isn’t just a flash in the pan, but rather the first stages of a protracted campaign by both sides. The first part of the article argues that this is indeed the case, and accordingly, it takes a proactive stance in analyzing the interests of the four main state players – Turkey, Israel, Iran, and the US – in order to game out the probable scenarios that might unfold in the coming couple of years. Part II then examines the four most likely ones (which follow somewhat of a sequential, intertwined logic) and then summarizes the strategic conclusions from the entire exercise, before concluding with a few closing thoughts about the topic. The essence of Turkey’s position is that it is unenviably caught between two dueling dilemmas. As for the first one (elaborated more in-depth in the author’s earlier pieceon the topic), it deals with the competing trends of nationalist sentiment and anti-government expression, which are coming even more intensely to a head as a result of the anti-Kurdish campaign. Erdogan planned for the war to unleash an outpouring of nationalist support for his AKP party that would allow them to sweep any forthcoming snap elections and attain the parliamentary majority that he’s been hoping for, but he also unwittingly created a political pressure valve for growing anti-government tension that might spill over and ruin his electoral hopes. The Republican People’s Party opposition might team up with the Kurdish-affiliated People’s Democratic Party (either formally or tactically) and take votes away from AKP party and Nationalist Movement Party’s supporters disillusioned by Erdogan’s aggressive and domestically divisive policies, especially if the Kurdish campaign isn’t as rapidly successful as the President has planned for it to be. Should this occur, then it would embarrassingly deal a second devastating political defeat for Turkey’s leader and all but end whatever dreams he has of further transforming the country in accordance to his vision. The second dilemma, meanwhile, is directly related to the first, in that it deals with the tactical aspects of the anti-Kurdish campaign that would have the strongest reverberations on public opinion, and thus, on their perception of the President and whether or not citizens will vote to support his party in any upcoming elections. 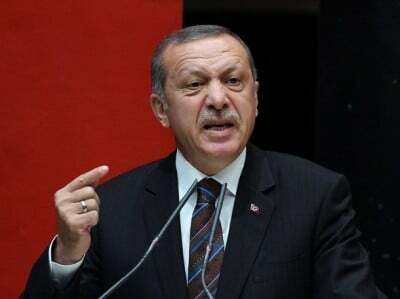 In order for Erdogan to be in as militarily advantageous of a position as possible for launching a feared attack on the Syrian Arab Army and thus also maximizing his nationalist appeal in the country, he must first “finish what he started” with the Kurds in Turkey, Iraq, and Syria, or otherwise risk being bogged down to the point of having to abandon the entire anti-Syrian operation entirely. He could, of course, make a go for it regardless, but then he runs the very probable chance of an even more emboldened Kurdish uprising upsetting his rear guard defenses in southeast Turkey, and thus ‘stabbing him in the back’ while his most experienced and battle-hardened military forces are focused on attacking the Syrian Arab Army. The crux of this dilemma is that the longer any punitive (and if he intends to invade Syria and avoid an opportunistic rear guard attack, ‘tactically necessary’) anti-Kurdish operations are undertaken, and particularly if they’re met with lackluster success or even unexpectedly huge casualties, the more likely it is that support for Erdogan and his war will falter, thus negating the nationalist benefit that he hoped to receive from the war and transfer into political capital. As previously said, it can also offset the entire plan for invading Syria, too, which would place him in hot water with his American allies that are depending on him in the coming weeks. 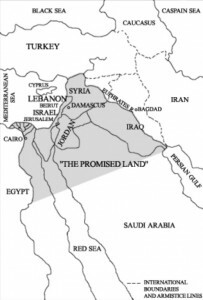 Israel’s plan for the Middle East as presented by Oded Yinon, an Israeli journalist and a former officer of the Foreign Ministry of Israel. Tel Aviv’s interests in Turkish Kurdistan are very straightforward, and they pertain primarily to safeguarding the nearby BTC pipeline that supplies Israel with 40% of its oil needs. Kurdish militants recently attacked the line last week, and although causing scant material damage or service disruptions (it was scheduled in advance to be shut down this month for maintenance), it did raise questions about its overall vulnerability to repeat attacks if the Turkish-Kurdish War isn’t resolved soon. Still, Israel isn’t all that worried because it’s historically enjoyed warm relations with the Kurds, especially the ones in Iraq whose independence it publicly spoke out in favor of last summer. While the Kurds are somewhat of a disparate people in terms of their local languages and recent historical memory, it’s very possible that Israel can activate the goodwill its gained from the Iraqi-based members of the community (the ‘torch bearers’ of any possible independence) to expand its influence over their counterparts across the border, at least in order to receive (paid-for) guarantees that its strategic pipeline will remain safe from further attacks. But this is Israel that’s being discussed, after all, and given its history of regional intrigue, there are other, deeper interests involved here as well, the main gist of which is the promotion of the Yinon Plan. In a nutshell, this relates to the physical destruction of the Muslim countries east of Israel’s borders through the support of secessionist identity divisions among their diverse populations. While not officially incorporating Turkey as part of its original plan, it’s quite foreseeable that the country would get sucked into it regardless as Tel Aviv tries to promote its plan for a ‘geopolitical Israel’ rising out of Kurdistan. This scenario will be described more in the next section, but the idea is simple enough – a new, transnational pro-Western stateemerging out of the borders of established ones in the heart of the Mideast would allow Israel and its American ally to project influence all around its frontier and further undermine Syria, Iraq, Iran, and, if it decides to pivot eastward, even Turkey. This ploy would thus help the West weaken the Resistance Arc between Damascus and Tehran (passing through Baghdad) that presents a serious impediment to the implementation of its hegemonic designs in the region. Interestingly enough, like Israel, Iran also has energy-motivated reasons that compel it to have a positive relationship with the Turkish Kurds, albeit of a different nature than Tel Aviv’s. No significant infrastructure has yet been developed between the two (save for the fledgling Tabriz-Ankara pipeline), but it’s the future prospects of such that are guiding Tehran’s decision makers in this matter. There’s excited talk in the EU that Iran could one day supply it with all the gas it wants via a linkup to the Southern Energy Corridor through the TANAP pipeline (itself a branch of BTC pipeline breaking off from Erzurum, incidentally the same place that the Kurds attacked last week). Taking matters even further, Iran might even be hoping to geographically facilitate the shipment of Turkmen gas exports to the EU as well, via a Turkmen-Iranian-Turkish pipeline that feeds into TANAP. Provoking such a juicy geopolitical forecast is that Turkey and Turkmenistan signed an agreement on energy cooperation earlier this year, and in a post-sanctions environment yet one in which the issue of Caspian delineation has yet to be settled, it would make a lot more sense for Ashgabat’s exports to traverse Iran en route to Turkey than to expensively go under the undefined Caspian and then detour through Azerbaijan and Georgia to get to the same destination. It should also go without saying that in general, Iran wants a stable border with Turkey so as to facilitate real-sector economic trade between the two, and by extension, between it and the EU through the Anatolian transit state. This means that Iran can be expected to maintain positive relations with both Turkey and the Kurds, not wanting to incite either of them and advocating for a peaceful settlement (and perhaps even playing a mediation role) between the two. As optimistic as that may sound, however, it’s still not likely to happen in the near future (or at all, given the overall premise that the clashes are the opening part of a protracted campaign), so Iran’s going to have to balance its diplomatic initiatives with both of them in order to avoid upsetting the other. It would prefer for a united Turkey to continue into perpetuity as a stable and geographic facilitator of Iranian-Western trade, but the chaotic and somewhat uncontrollable processes unleashed by the US in the pursuit of its “New Middle East” might require a policy revision. This is because Iran is also home to a sizeable minority of Kurds itself, and upsetting that domestic community via statements and/or actions regarding their Turkish counterparts could be the trigger for a secessionist campaign inside the Islamic Republic (one which was hinted at during the early May ‘test run’ in Mahabad). 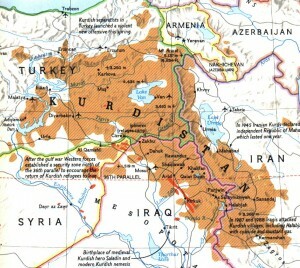 Iran is thus apprehensive about an independent Kurdistan in general (be it in Turkey, Iraq, or the combined Kurdish portions of both states), which is heightened by its fear that such an entity could become a pro-American irredentist irritant against it, but if it shows signs of being neutral towards or possibly even supportive of Iran (as was suggested by the author back in January), then Tehran could reluctantly accept its existence, although it might by no means be actively supportive of its armed struggle. One must always remember that Iran is in favor of stability around all of its borders, and that destabilization in its periphery, specifically in Turkey, is detrimental towards its grand strategy of achieving a peaceful and mutually prosperous Mideast. The Kurdish insurgency might also realistically complicate Iran’s plans to become a central node along China’s New Silk Road, because even if it ends soon enough with minimal border destabilization and negligible economic impact, the creation of an unreliable pro-American client state between Iran and Turkey would mean that the US could always play a Ukraine-like hand at having the geo-pivotal transit state interfere with gas and good shipments between the two. This is yet another geostrategic calculation that must be taken into consideration by Iran, and one which drives it to maintain a positive connection with Turkey’s Kurdish community no matter what the outcome of the latest war might eventually be. The US is playing a double-sided game between Turkey and Kurds, but it’s one in which it stands to benefit regardless of the outcome. The core of the matter is that the US overly supported Kurdish nationalists under the banner of fighting ISIL in order to pressure Turkey into a conventional invasion of Syria on Washington’s terms (incidentally, also under the cover of ‘fighting ISIL’, which has become the hegemon’s favored excuse for the latest round of regional aggression). Ankara didn’t bite the bait until recently, hoping to hold out as long as possible in order to procure the most favorable terms that it could prior its prospective ‘adventure’, but it turned out that Kurdish nationalism had somewhat unexpectedly (for Turkey) become too big too quickly for it to ignore, and the killing of two policemen by PKK militants in the aftermath of the suspicious ISIL-attributed Suruc suicide bombing necessitated an electioneering-minded military response by Erdogan. The position of the US is in this conflict is Machiavellian to the max. It supports the Turks as they battle the PKK, but it’s also giving aid to the Syrian-based PYG Kurdish militia and the Kurdish Regional Government in Iraq, knowing full well that the training and weapons it provides will likely be funneled to their affiliated PKK partners in fighting Turkey. This circular logic isn’t incidental, as it’s all part of a larger plan by the US. One the one hand, it wants to see how far along Turkey can go in invading Syria, and when/if it hits a wall (be it with the Syrian Arab Army and/or the Kurds), it could then reverse its support for Ankara (ergo the semi-critical talk about a “proportionate response” in attacking the PKK) and try to turn all the Kurdish groups against it in order to begin the formal dismemberment of the Mideast and give birth to the ‘geopolitical Israel’ of Kurdistan. Looked at in this way, the US is treating Erdogan as if he were a crazed and charging bull, and the Kurds are the red cape used to provoke him. Part of the latter might sustain some damage during the highly publicized event, but a master matador will never let his muleta get shredded (let alone himself impaled) as he patiently carries on with the long-running bull-killing spectacle. To say it more directly, the Kurds are the cannon fodder that the US has successfully used to lure Erdogan into Syria, and when he oversteps in some way or another (which seems to be inevitable at this point, as per the dueling dilemmas described earlier), the US plans to turn around and use the Kurds against him to inflict a crippling blow against Turkey that will lead to the creation of an independent Kurdistan. Therefore, the US is simply biding its time and watching how events unfold, knowing that its strategic intervention (or lack thereof) at any juncture of time can likely succeed in guiding the scenario towards one of its two anticipated win-win foreign policy victories, be it having Turkey conventionally invade Syria (with the US ignoring the Kurds’ plea for more covert support) or midwifing the birth of a pro-American Kurdish state (provided that the Kurds don’t cozy up too closely to Iran before then).